Brush Runabout Company, later named the Brush Motorcar Company, was founded in 1906 by Alanson P. Brush, in Detroit, MI. 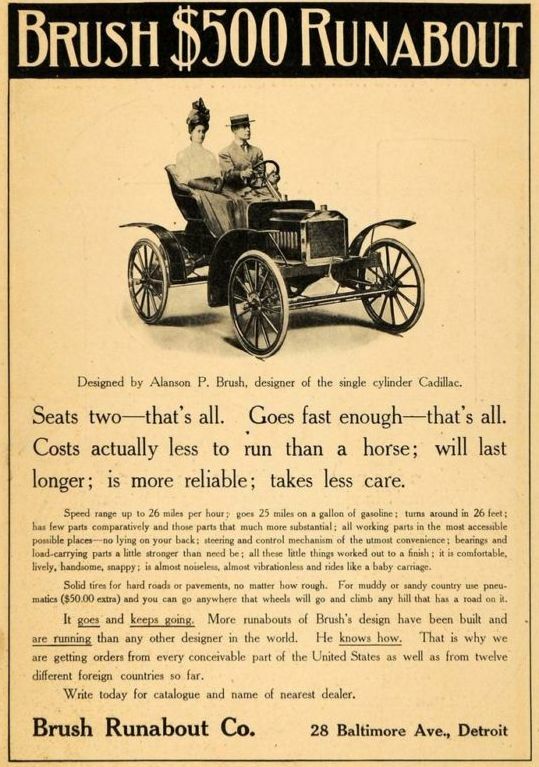 Brush encouraged people of ordinary means to give up horses and buy cars, as you can see in the advertisement below. Brush emphasized small size to reduce costs and performance on the mainly dirt roads that were bumpy in dry weather and muddy in wet weather. The car sold for only $500.00 in 1907. Brush was merged in 1910 with several other automobile companies into the United States Motor Company. The United States Motor Company was organized by Benjamin Briscoe, and was somewhat an attempt to copycat and compete with GM. This effort to try to save independent automobile companies included: Maxwell, Stoddard-Dayton, Courier Car Co, Columbia Automobile Company, Brush Motor Car Company, Alden, Sampson Trucks, Gray, Marine, and Providence Engineering Works, and Thomas and others coming aboard later. Many of the vehicles in this new company had price reductions to stimulate sales. The Liberty Brush selling for $350.00 was the last attempt at saving Brush. 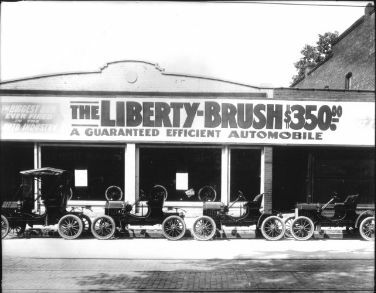 There is a photo of a Brush Liberty dealership posted below. 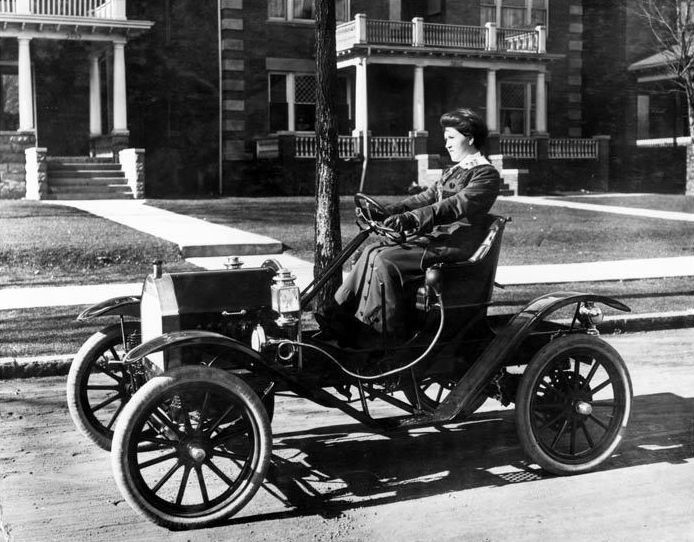 The last year for sale of the Brush automobile was 1912. Walter Flanders purchased the United States Motor Company and constituent companies for $7,080,000 at a public foreclosure sale in January of 1913 and reorganized the company as the Maxwell Motor Company, Inc. This was the only surviving member of the group, which later was reorganized and became Chrysler. Below is the Brush Runabout factory. 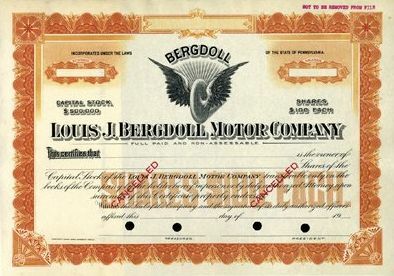 Louis Bergdoll came to the United States from Germany, and founded the Louis Bergdoll & Son’s Brewing Company in 1849. The company was very successful for over 70 years even with prohibition. The Bergdoll family became very wealthy making beer. Bergdoll was also known as an amateur automobile racer, who loved to race the 60 HP German built “Benz”. Grover C. Bergdoll, son of the founder, spent his time racing cars and flying planes, but gained his fame when the U.S. started drafting men into the service during the First World War. Grover asked to be assigned as a flight instructor, but the government turned him down. Grover refusing to enter the military and disappeared and was not found and arrested until 1920. 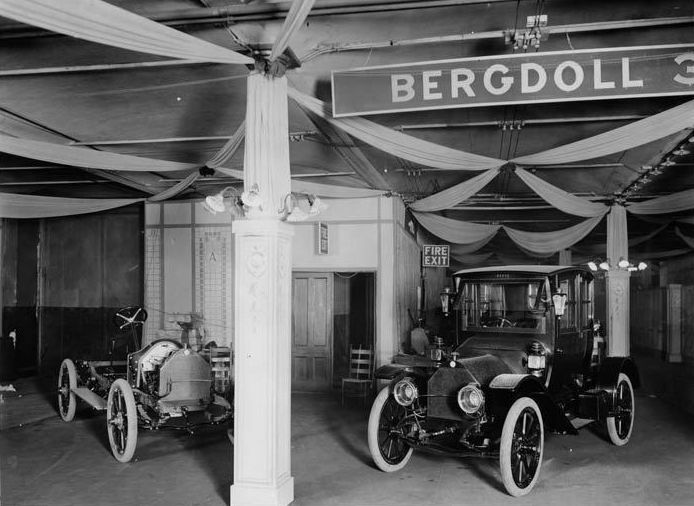 The Bergdoll produced the Bergdoll 30 series from 1908-1912, named apparently for the 30 horsepower motor, and the Bergdoll 40 in 1912 and 1913 with 40 horsepower engine. 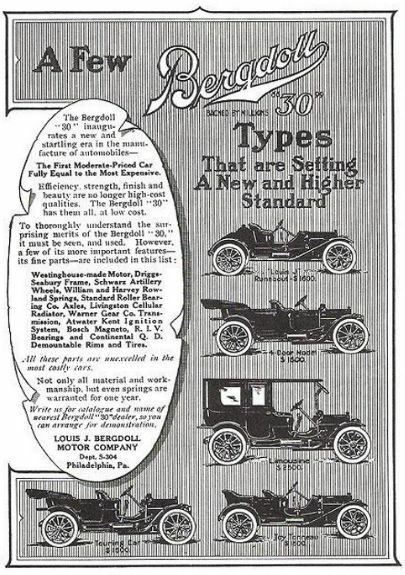 The photo above shows the series 30 and the ad below is the series 40 from 1912 that shows five different models. The 1912 “Louis J” Roadster, four door six passenger, and the Touring Car sold for $1,600.00, while, a five passenger Touring Car priced at $1,500.00 and the Limousine sold for $2,500.00. The company was adjudged bankrupt in the federal court for the eastern district of the State in April, of 1913. At the very bottom of the page is a copy of a stock certificate. There were only 3000 shares of stock to the company, so they would have been worth a substantial amount. In fact, court records show a battle to recover $155,571.79 the company allegedly owed share holders F. A. Harrigan and Joseph W. Catharine, both of Philadelphia, not decided in the U.S. Supreme Court until April 12, 1926. Between 1896 and 1929, there were over 1800 Automobile manufacturers in the United States. In the old car hobby, these car companies that have gone out of business are referred to as orphans. In 1929, the used car buyer would have had a large selection of used cars to choose from, considering all the orphans, along with the 60 plus active car companies. This section of my 1929 Pontiac blog is not a complete list of the orphan vehicles in 1929, but I will continue to post them as I get a chance. In 1929 when my Pontiac was new, there were still over 60 Automobile makes built in the United States, all posted on this site. I like to use actual factory photos and literature or old original photos, for reference–I think it is more fun and accurate than contemporary photos. Many of the manufactures purchased parts from other companies and assembled them. The Continental Motors Company produced engines for various independent manufacturers of automobiles from 1905 through the 1960s. This photo is an Elmore Baker Dealership, location unknown to me. 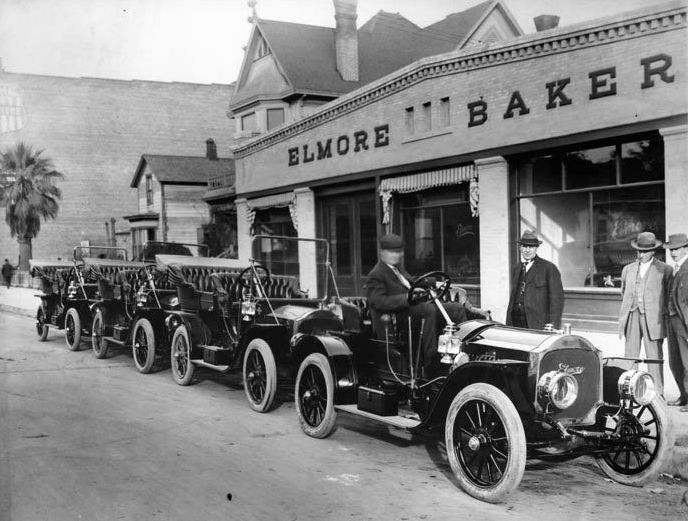 I don’t know who the men are, but the first car in line is a 1907 Elmore. I hope you enjoy looking at the vintage photos of early vehicles in these post as much as I do. In September of 1900, James Ward Packard, his brother William Doud Packard and their partner, George Lewis Weiss, in the city of Warren, Ohio founded the Ohio Automobile Company. On October 13, 1902, it was renamed the Packard Motor Car Company, while the cars were always sold as Packards. While the high-volume Oldsmobile Runabout sold for $650 the Packards concentrated on cars with prices starting at $2,600. Packard became the number one designer and producer of luxury automobiles in the United States with a following among wealthy purchasers both in the United States and abroad. The iconic Packard slogan was, “Ask the Man Who Owns One.” In addition to excellent luxury cars, Packard built trucks as well. 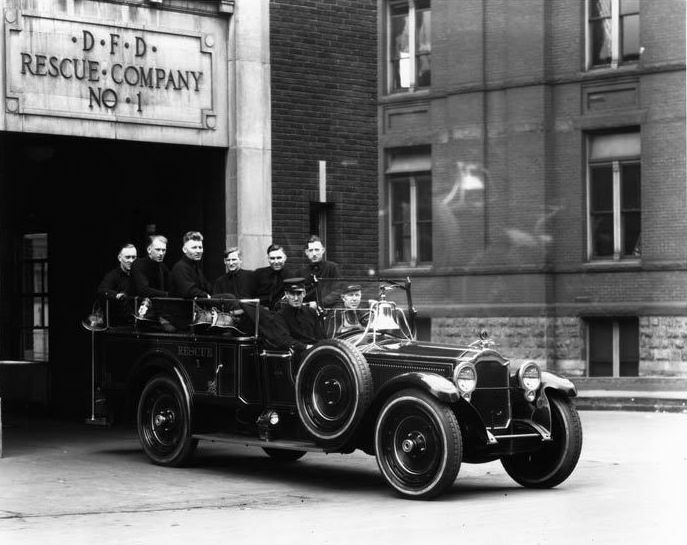 I have included a photo of a Packard fire truck for the Detroit Fire Department from 1921. Ransom E. Olds founded Oldsmobile in 1897 in Lansing, Michigan. The 1901 to 1904 Curved Dash was the first mass-produced car, made from the first automotive assembly line, an invention that is often miscredited to the Ford Motor Company. Even the history section of the Ford website admits Henry did not invent the car or the assembly line. In 1901, Oldsmobile produced 425 cars, making it the first high-volume gasoline-powered automobile manufacturer. Oldsmobile became the top selling car company in the United States in the early years. On April 10, 1929 the first Viking rolled off the assembly line as part of General Motors’ companion make program., Oldsmobile introduced the higher standard Viking to be marketed through the Oldsmobile dealers network. 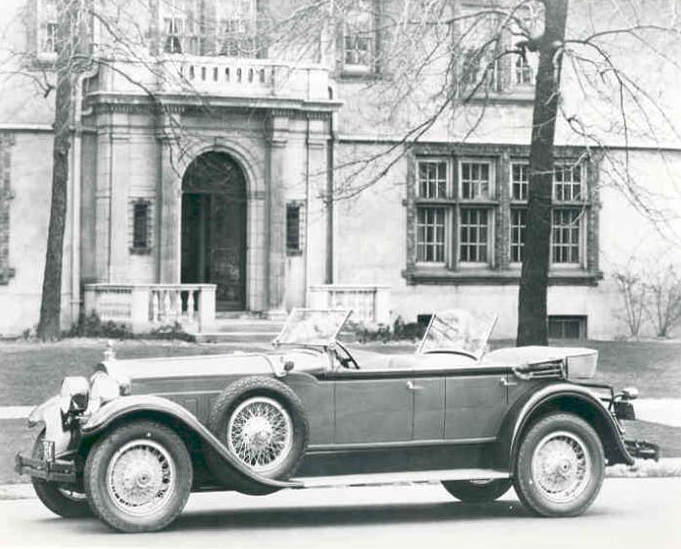 Total production for Oldsmobile in 1929 was 106,409 units, including 5260 Viking automobiles. When GM made the decision to stop production of the Oldsmobile, I was disappointed. This was America’s oldest automobile company, and was rich with automobile history and innovation. The final production day for Oldsmobile was April 29, 2004. The division’s last car built was an Alero GLS 4-door sedan. The last Olds was signed by all of the assembly line workers and is on display at the R.E. Olds Transportation Museum in Lansing, Michigan. Between 1896 and the Great Depression, there were over 1800 Automobile manufacturers in the United States. In the old car hobby, these car companies that have gone out of business are referred to as orphans. In 1929, the used car buyer would have had a large selection of used cars to choose from, considering all the orphans. General Motors started buying up some of the used cars and destroying them, or shipping them to Canada to keep the new car market open in major cities. When the Canadian auto market was flooded by U.S. built cars, they outlawed shipping cars into Canada. GM purchased factories and founded GM of Canada to get cars into the country. A lot of French printed literature for 1929 GM cars is available for that reason. That is also one reason you cannot ship cars out of the U.S. very easy today. 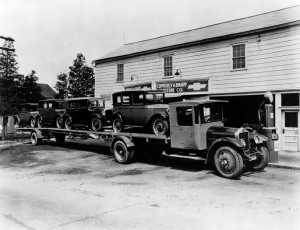 The photo above is a load of new 1929 Chevrolet models coming into the Chevy dealership. 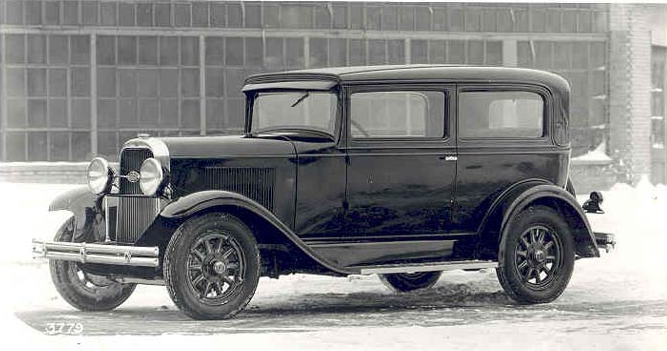 In 1929 when my Pontiac was new, there were still over 60 Automobile makes built in the United States. I wanted to share with you a list and photos of the vehicles that were available for the new car buyer to choose from in 1929. Most of the cars on this list also became orphans. I have used real vintage photographs when I had them in my collection because I think they are more fun. Life expectancy of an automobile in 1929 was 50,000 miles, but also due partially to the bodies built with an armored wood frame construction, few examples survived this early era of closed body production. GM used this method of construction until 1935. The photo on the bottom is of the Chevrolet assembly plant. I will post examples of the wood frame of the 1929 Pontiac from my fisher Body manual and photos of the Fisher Body plant. You will also note in my descriptions, many of the manufactures purchased parts from other companies and assembled them. 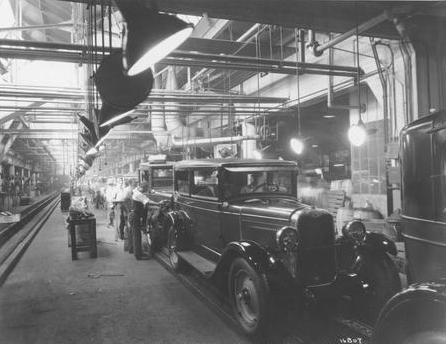 Fisher Body built bodies for many automobile companies, including Ford, until GM purchased Fisher to assure they would have all the bodies supplied to them they would need. The Continental Motors Company produced engines for various independent manufacturers of automobiles from 1905 through the 1960s. 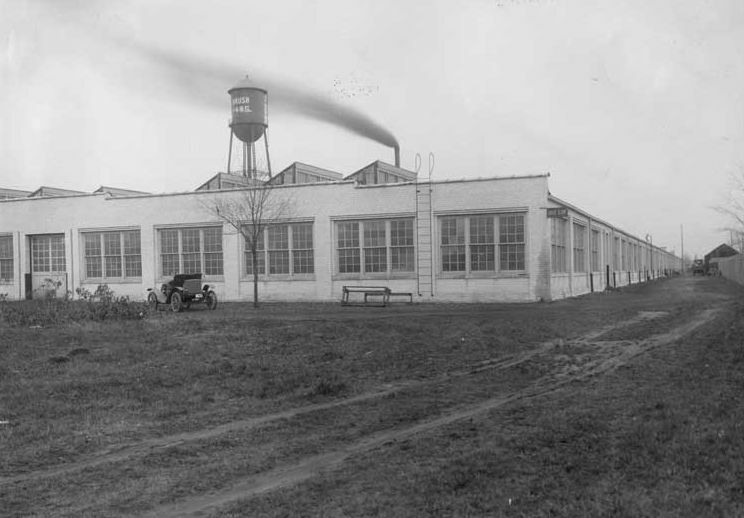 Ford purchased his early engines from Dodge Brothers. Henry Ford was a master at cutting cost to keep the price of his car down. He designed the shipping crates and required them not to be damaged in shipping because he would use the shipping crates for the wood parts to build his cars. I will continue to post The Automobiles of 1929 (and a few trucks) until I get them all posted. This is a hobby, not my job, so thanks for being patient. You probably have heard the old expression, “All roads lead to Rome” at some point in time. When you think of “The Roman Road” today, perhaps you think of sharing the gospel of Christ by using scripture from the book of Romans. The fact is, in Old Testament times, the Romans were the best road builders in the world. Roman roads were straight and level and were made of four layers. They would start with a layer of sand, followed by pieces of stone and rock in concrete, then crushed stone in concrete, and finally a paved surface. Proper drainage was also provided, and where the roads went into the cities, there were raised walkways for pedestrians. Sounds better than the United States roads before the automobile came on the scene, doesn’t it? Don’t you like the mile markers we have on our interstate system today? Well, in Old Testament times, the Romans placed milestones along the advanced roads to show travelers how far it was to the destination and how far they had come. These stones served another purpose, since Roman law made it possible for a soldier to compel a civilian to carry his pack from one milestone to the next. Jesus had this in mind when he said that if anyone compels us to go one mile, we should be willing to go an extra mile. That is a hard teaching to live by for most of us. Pride, and our sense of justice stand in the way of the “Roman road” to the gospel for us. I have a map of Florida from 1925, given away by Ford Motor Company. (No I am not that old.) None of the roads I use today are on that map. I remember when I was a boy, (in the 1960’s) you could walk in almost any service station and get a free road map. Being able to plan a trip is not something that took place after the first automobiles. Fifty thousand miles of roads were built with this advanced paving throughout the Roman Empire. In the shops in Rome during those days, road maps were even available for purchase. God also wants us to be able to make plans for our life journey, so He gave us a road map we call the Bible. People did not like traveling in those days for several reasons. Travelers were in danger from bandits. Today, if you look at things from God’s perspective, there are people who have been robbed all around us. You may have been robbed as well, and not realize it. Has Satan been robbing you? Has he stolen your joy…Your peace? How much have you lost, and how much more will he get? Jesus came to give us life to the full, but the enemy lurks on our journey in life to devour us. He doesn’t really need your stuff, he just wants your joy, and your peace, and your relationship with Christ. God knows when you are hurting. He will restore you and make you strong, firm and steadfast, even if it does not seem that is possible right now. Don’t feed the lions! Travelers were completely at the mercy of the local people in that day. Staging posts for the ordinary traveler developed. The inn was built around a central courtyard. Stabling for animals was provided at courtyard level, and other accommodation was above. It was the ancient equivalent of a motel. In theory, the staging posts provided free accommodation, food, and other services were paid for. It was a feature of most of the inns that prostitution was part of the system. Jesus told his disciples to seek accommodations elsewhere. That is one reason it was so important for first century Christians to practice hospitality. “Whatever town or village you enter, search for some worthy person there and stay at his house until you leave. another problem with a journey in that day was that taxes had to be paid on goods, wheels, axles, and persons as one passed through successive tax districts. (Toll roads apparently aren’t our idea either.) Your journey in life may seem quite “taxing” at times. Do you feel like one more thing to go wrong and you will break down in despair? Maybe your journey is just there at this time. Maybe the despair has become the lion who devoured your hope and your joy. Is your hope in your ability to navigate through the trouble you face along this journey, or in the one who called you to it? Is not the destination of your journey, and those around you much more important than where you came from? Greetings on a journey took time. It was not considered polite simply to pass the time of day. It was necessary to ask and receive answers to questions such as “Where are you going? Where are you from? What is your name? How many children have you?” and so on. (Today it would be considered profiling by many.) Jesus gave practical instruction when it came to all these issues. Go! I am sending you out like lambs among wolves. Do not take a purse or bag or sandals; and do not greet anyone on the road. “When you enter a house, first say, ‘Peace to this house.’ If a man of peace is there, your peace will rest on him; if not, it will return to you. Stay in that house, eating and drinking whatever they give you, for the worker deserves his wages. Do not move around from house to house. While you are on this journey in life, you will greet many people. Remember where you came from. There are others around you going through things you have experienced, and they may need help. Will you be that Samaritan on the road of mercy? Your life experiences may bring the encouragement someone needs. Remember where your journey in this life will end. Will you use the “Roman road” of the gospel to provide a map for those who are lost? Jesus knows we are like sheep among wolves, but the peace of God has no limitations except the ones we ourselves place upon it. The journey of life is often inconvenient, dangerous, and taxing, but there are many others going through the same thing you have already seen on your journey. I pray God gives you some encouragement through these words that your journey will be a little less burdensome. We are all in this together, and that includes Jesus. God has given us wonderful facility to think of creative ways to accomplish a task or goal. In the late 1800’s and early 1900’s there were creative thinkers working on all types of projects to make life better. By 1909 there were already hundreds of automobile manufactures in the United States, so a creative thinker in Chicago, tried to take his place in a competitive market. A new car company named “Auto Parts” was born. The Auto Parts was a 23 horsepower automobile that sold for $600.00. Where is the creativity in that, you say? Well, the car was available with a payment installment plan. The thing is, the car was shipped to you in pieces you had to assemble yourself. The payment plan was simple–they would ship parts as they were paid for. The name of the car makes sense now, doesn’t it? The Auto Parts Automobile Company was born and died in 1909. Not enough people took them up on the idea, and tweaking the business model of the company never happened. Other ideas seemed worthy of tweaking. During the First World War, air combat was developing into a valuable asset. At first, guns were carried along to shoot at enemy planes. Some creative thinker came up with the idea to mount a machine gun on the top wing. Aiming the gun to shoot an enemy aircraft down was not an easy task. The creative thinkers went to work and mounted a machine gun in front of the pilot so he could take aim. The trouble with that was, the guns shot the propellers off, and we lost as many planes as were shot down. “No problem!” said the creative thinkers. They added a piece of steel on the propeller blades to stop the bullets that did not pass between the blades from damaging the wood propellers. It didn’t take long to realize the bullets now ricochet back onto the pilot. Finally, a German by the name of Fokker, came up with the idea of a cam shaft to control the trigger of the machine gun to only fire between the propeller blades. Pilots were now free of the Hanna-Barbara cartoon effects of air combat. When it comes to creativity, God has given us an incredible gift of thinking. Are you thinking you should give up right now, or are you thinking of new ways to accomplish your goals? If God has given birth to an idea in your mind, no matter if it may be ministry, business, or otherwise–He will guide you through the process of how to accomplish His will. Dwell means to inhabit, so wisdom has taken up with prudence. Prudence is right knowledge for special times, which can better a man’s position in human affairs. Wisdom’s possession of knowledge and ability to construct witty inventions, or well-thought-out plans, makes a grand gift from God. It is a good thing to be able to think outside the box, but we must never forget what is inside the box. That is, do not forget the creator when you need to be creative. You may say to yourself, “My power and the strength of my hands have produced this wealth for me.” But remember the LORD your God, for it is he who gives you the ability to produce wealth, and so confirms his covenant, which he swore to your forefathers, as it is today. If you ever forget the LORD your God and follow other gods and worship and bow down to them, I testify against you today that you will surely be destroyed. In the midst of being creative and working hard, you should find the peace of God in your life. You may find yourself feeling at times as though there aren’t enough hours in the day. God created the day, therefore, there are just enough hours in each day. We must learn to be good managers of the greatest commodity God gave us, which is our time. I think the words of Marion Harland, in her book, “The Secrets of A Happy Home”, leave us with a proper thought toward stress. This is what I mean by thinking outside the box without forgetting what’s inside the box. Always give thought and much prayer to your activities. It could be the difference between giving up on an idea, experiencing more failures than necessary, or allowing God to provide what is needed, including creative ideas to accomplish His will.